I recently got a copy of Hope; The Hero Initiative. 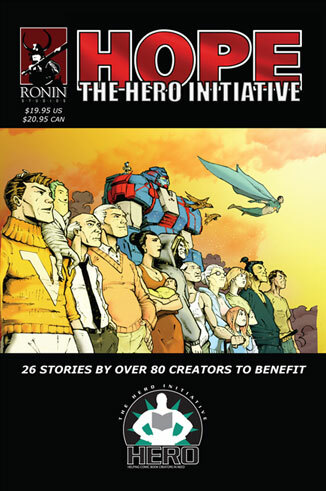 It's an anthology that collects dozens of stories with all profits going directly to the Hero Initiative. I'm told that it's the first comic done to sport the Hero Initiative logo, which I would take to mean it's got some approval/support from the organization, rather than just a bunch of guys who say they want to help Hero. Like many anthologies, the stories in Hope range in style and length and genre. Thematically, though, they all pretty directly speak to the notion of using hope to carry one through some of the darker times. What's a little more striking, though, comes from the context of the book benefiting the Hero Initiative. Several of the stories are pretty direct analogies to the types of comic creators that the organization supports. The book opens with the old superhero from the 1940s who became derided for being out of his time. There's another story about an old comic creator who's fallen out of popular favor, but is surprised to find one young fan who still loves his work and looks to him as a mentor. Another is a lawyer who works to fight injustice in the courtrooms during the day, and dons a costume to fight crime at night, yet still feels he's not doing enough. There's the story of a cancer patient who blogs from his hospital bed and doesn't realize that his writing has touched the lives of many people that he's never even heard of. Not all of the stories speak so directly (at least within this book's context) to the experiences of professional comic creators which have sometimes laid in obscurity. But those that do seem to be the most poignant. Not that they're overpowering or particularly blatant. It's just that viewing them in a book with a Hero Initiative logo on the front casts them in a slightly different light. Were that logo absent, I don't think people would "get" most of the analogies and I think that speaks to the level of quality of these stories. I would think the more poorly written ones would be much more obvious. It's a good book. A good read. And for a good cause. Worth picking up if you have the opportunity. It should be available through most comic shops.